When Montgomery County EFCU CEO Jim Norris asked his staff to increase credit card activity at the $81 million Germantown, MD credit union, he wasn’t afraid to issue a few pink slips. 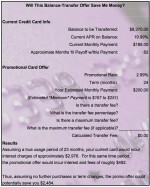 A direct mail flyer announcing an attractive 2.99% APR for nine months on all credit card balance transfers was developed alongside a matching statement stuffer. Norris also went to the airwaves with a radio ad announcing the new program. The results were impressive. Montgomery County EFCU’s 12-month card loan shot up 19% over the previous 12-month period and Norris predicts that growth to reach 35% this year. 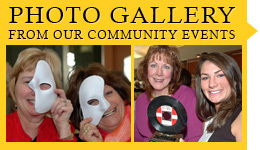 More details on the “Think Pink” program appear in the Q&A on the latest issue of “TurnKey”. Just click the image to the right to download your copy. 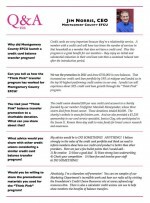 And click the links below to review Montgomery County EFCU’s marketing materials used to promote “Think Pink”. 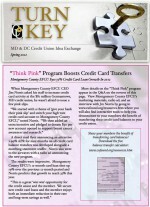 View Montgomery County EFCU’s “Think Pink” credit card balance transfer marketing materials. Help your members see the benefit of transferring high-rate credit card balances to your credit union’s credit card program. Download the balance transfer calculator.